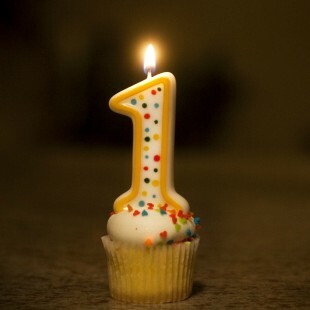 One year ago today I published my first post. I remember it quite distinctively. Hours and hours sat slaving away in front of the laptop. I must have read that post , half a dozen times before finally taking the plunge and pressing the intimidating ‘publish’ button. A year later, I feel like I’ve nearly found my feet, but there’s been plenty of stumbling around in between. So, why bother? I work in a school where blogging and using twitter doesn’t have a particularly high profile, despite the best efforts of a couple of social media converts. Indeed, a common response in the staff room is that using social media outside of school would be a ‘waste’ of time. I tend not to respond to these comments. Like most CPD, if twitter and blogging are forced down teachers’ throats as a fail-safe way of improving practice, they’re likely to fail. I’d never claim that blogging will definitely improve someone as a teacher, but I’d like to offer a few reasons why I don’t think it’s been a waste of my time. Around 18 months ago, I went to a teach-meet at Clevedon School, attending a great workshop by Alex Quigley on written feedback (link here). Alex opened his workshop with the hookline ‘teachers are doing it for themselves’ explaining that very little of CPD has a transformative effect on teacher practice, so if we really want to improve we might have to ‘do it for ourselves.’ I don’t envy those who have to plan CPD. Any given staff body will have a variety of needs and differences in attitude. Perhaps unsurprisingly, I have definitely attended sessions which haven’t offerred me anything new. And, even when CPD is really good, I don’t think an hour a week is enough. Blogging gives me the power to take part in CPD activities whenever I want. Together with twitter, wordpress provides a personalised stream of CPD, for when an hour a week just won’t do. Alex also mentioned the teacher ‘plateau’, whereby after a couple of years and achieving a certain level of competence, teachers tend to level out and stop improving. This scares me. There’s so many areas of my teaching which I know can improve, I’m hoping blogging will help me break free from the ‘Ok Plateau’. One thing I’ve learned from blogging is the importance of doubt. There’s far too much received wisdom in teaching, whether it’s schools favouring a certain pedagogical method, or teacher training institutes glossing over unfashionable methods. I left my teacher training ‘knowing’ what being a good teacher meant. Yet, two years later I was writing a blogpost bemoaning how little I knew at this stage. Thanks to twitter and blogging, I’m now aware of a variety of approaches to teaching I had never previously heard of and I’m also far more inclined to doubt my own beliefs and question any received wisdom. This is especially important when actually writing a blogpost. There’s something rigorous about writing down an idea which helps me work through doubts and consolidate my thinking. Then, and only then, do I feel comfortable publishing a post. Through this process, I’ve been able to criticise my own curriculum decisions, question how Speaking and Listening tasks are conducted, and explore how my choices in KS3 texts might have been letting down my learners. When I have serious doubts, I blog about them, and through this process strengthen my own beliefs. That’s not to say that blogging can’t be a fantastic way to vent. I’ve written several posts during times of frustration: Frustration about the process of lesson observations, frustration about the educational fetish of ‘showing progress’, even frustration about how sometimes adults in school can model low expectations. However, even when venting, the process of writing these thoughts down helps me reflect and increases the power in my convictions. Every teacher needs to vent sometimes. Blogging is great for this. As well as being a great source of CPD, my blog has also become a source of pride. 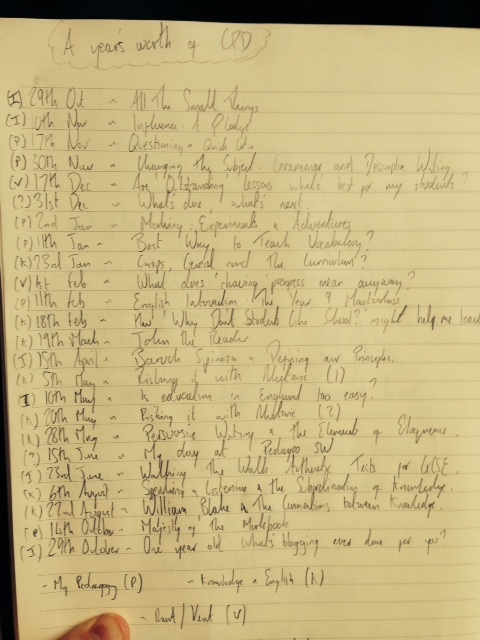 I’ve written 24 posts – probably around 25,000 words on education in a year. Sure, when I look back on some of my old posts I wince a little, but I’m not too proud to admit I think this is a pretty decent effort. One particular highlight was my blog getting mentioned on The Guardian Teacher Network, my mum was proud anyway. I was also flattered that Andy Tharby included one of my posts in his blog ’25 Practical Blogposts for the English Teacher’. Finally, blogging has opened up a great range of possibilities. I finally got the courage to speak at a couple of teach meets this year, and used ideas from my blog. I’ve also met a lot of really lovely and interesting educators off-of-twitter, which I’m sure would never have happened if I’d have remained merely a silent twitter user. I’d like to end this post with a few thank-yous. Firstly, to the echochamber for their tireless efforts and commitment to helping new bloggers get a voice. Thanks to everyone on Twitter for reading/retweeting. I really appreciate this, and hope I always reply to show my thanks. Finally, thanks to anyone that’s read, commented on, and questioned my ideas. I’m looking forward to year two. Alex’s blog on overcoming the ‘Ok Plateau’.